Please join us at Art People Gallery to celebrate Nowruz, the Persian New Year, and an exhibit of Persian art. The 30 winners of our SNAC Iran 2012 competition will show their works at Art People. 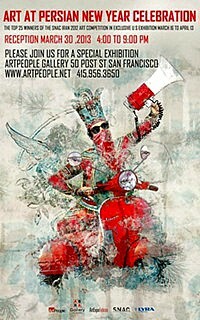 The show runs from March 16 to Apr 6 at the Artpeople Gallery San Francisco.